Every day we’re reminded that American military personnel are serving in foreign lands. As we write and publish GreenOrlando each and every month I’m ever mindful of those who give of themselves and put their lives on the line to secure our freedom and way of life. Unfortunately, today’s climate in mainstream media often only shows the negative things occurring around the world. This publication’s mission is to shine a spotlight on the good news. If I were in Iraq or Afghanistan or South Korea, I’d want to find some comfort in my down-time. If I lived in Central Florida and served abroad, I’d want to read stories that make me feel good about the people back home. Each month we talk about organizations and people making a difference. Each month we reveal people who give of themselves to make our communities better, to help those in need. As Memorial Day passes, we all should take a moment to reflect on those who came before and have given us the freedom and security to do all that have. We need to remember sacrifices both great and small, both the timeless ultimate sacrifice of life and limb and the daily chores each soldier endures, that you and I can live our lives and pursue our dreams. GreenBrevard offers our gratitude to those who serve. Pass us your stories and help us celebrate the heroes in our midst. What can we do to let them know that their service is appreciated? What can we do to help ease the daily burdens of our brave men and women, and their families? One thing we can do is help is to support the USO. 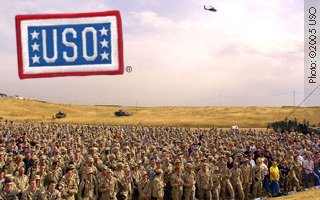 Since before the United States entered World War II, the USO (United Service Organizations) has been a bridge between the American people and the U.S. military. In times of peace and war, the USO has consistently delivered its special brand of comfort, morale and recreational services to service members and their families. A nonprofit, congressionally chartered, private organization, the USO relies on the generosity of individuals, organizations and corporations to support USO activities. The USO is not part of the U.S. Government but is endorsed by the President of the United States and the Department of Defense. Each President has been the Honorary Chairman of the USO since its inception. Visit the USO’s site or donate by phone or mail. To donate by phone, please call 1-800-876-7469. 24 hours a day, 7 days a week they are there to accept your donations. USO’s Operation Phone Home Program and Care Package Program both help. So far, they have distributed more than 555,000 Care Packages and nearly 300,000 prepaid, international phone cards to troops. One more thing you can do is work with 7-Eleven as 7-Eleven and USO band together to support U.S. troops through sale of wristbands. 7-Eleven® customers can support American troops and the United Service Organizations (USO) ® by purchasing a “Support Our Troops” wristband. For each wristband sold, $1 will be donated to the USO to fund programs and services for military service members and their families worldwide. Suitably camouflage-green in color, the wristband is embossed with “Support Our Troops” on one side and “USO” on the other. They are currently rolling out to participating 7-Eleven stores nationwide and will be available exclusively at those 7-Eleven stores while supplies last. “Purchasing a wristband not only supports the USO’s efforts on behalf of service members around the world, it also is a visible sign of support for those men and women who are sacrificing so much for their country. The USO greatly appreciates the support of 7-Eleven,” said Edward A. Powell, USO president and CEO. Thank you for helping the USO deliver America!